Welcome to the Live Casino section of The Canadian Gambler. Here you will find trusted online casinos with live dealers, either in a studio set up just for people playing online with live dealers, or video feeds from land based casinos where you can play along with the people that are in the casino. Live Roulette seems to be the most popular, it looks like every live online casino has this game. Other games that can be found are Live Blackjack, Live Baccarat, and Lucky Live Casino even has Live Texas Hold’em during most of the day. Obviously the emphasis is put on the live games in these casinos, so the slots tend to be lacking in quality, but if you want to play slots, there are plenty of other online casinos that focus more on entertaining and unique slot machines. Enjoy the live casino games at the trusted casinos below. Lucky Live Casino allows you to play live casino games along with players inside the Fitzwilliam Card Club and Casino in Dublin, Ireland. You get an audio and video feed to see and hear everything that is going on, you can also chat with the dealers and even tip them if you like. 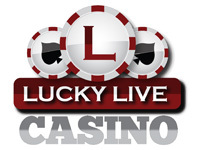 Lucky Live Casino offers live roulette, live blackjack, and live baccarat 24 hours a day 7 days a week, and then live Texas Hold’em from 7am to 6pm Dublin time. They also offer several slots, though not the most exciting ones, along with video poker, table games, and Keno provided by Distance Gaming. All of these games are played within your web browser, no download is required. Sign up now and get a 100% bonus on your first deposit, plus enjoy their daily bonuses and other great promotions like iPad and Rolex giveaways. Sports Interaction has a live dealer online casino powered by xProGaming software and has all four of the most popular casino games that require dealers. Baccarat, Blackjack, Roulette and Casino Hold’em are all available. As far as the Live Casino, the software is easy to use, innovative and straight to the point. No download is required so it’s available for both Windows and Mac users, making it easy for just about anyone to play. All you need to do is sign in using your current details or create a new real money account and you can access all parts of Sports Interaction, including the live casino, sports betting, Playtech powered casino with over 250 games, poker, and more. The only negative thing that I can say about Sports Interaction Live Casino is that there are no bonuses being offered to new players. However, if you are into playing live dealer games, Sports Interaction is still highly recommended. Fairway Casino launched in 2010 with live dealers for Roulette, Baccarat, and Blackjack, using Visionary Gaming software to stream the games and allow you to interact with the dealers. The casino also has a large selection of RNG (Random Number Generator) games including video poker, card games, slots, roulette, and a new section for 3D slots which have very nice graphics. Fairway Casino is licensed in Costa Rica where they have a studio set up for providing players from around the world with live dealer casino games. The dealers are attractive and friendly, and they always deal a fair game. The live casino games, along with the RNG games, are regularly tested for fairness. Sign up today and get a 100% bonus up to €100 when you make your first deposit. You can make a deposit in almost any currency, it will be converted to Euros so that everyone is playing the tables with the same currency. Celtic Casino offers live dealers in a studio set up just for that purpose. Live casinos of this type allow for more interaction with the dealers since they aren’t distracted by the players in a casino. They will often say hi when you join the table, you can chat with them and tip them as well, which they often thank you for. 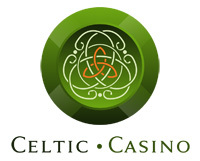 The live casino games available at Celtic Casino are live baccarat, live roulette, and live blackjack. They also offer several slots, video poker, table games, and more RNG (Random Number Generator) games. All of these games are played within your favorite web browser, with no need to download anything. Like most other live casinos, the emphasis is on the live games, but the slots are actually quite good. They have nice graphics that look great full screen. Sign up today and get 50% cash back on your first deposit.